Karamuru Hoe Race from Karla Brunet on Vimeo. 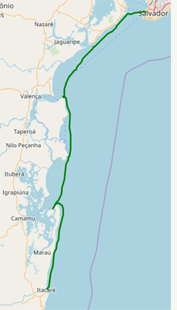 The Outrigger Canoe Club – Canoa Bahia – that I participate decided to make a pilot 3-day race, from Salvador to Itacaré. I am not a competitive person nor do I have the dedication of who participates in competitions, but since it was only for us from the club, a pilot version, I decided to face the challenge. I did a special training in the gym to have more resistance and to be able to withstand the 3 days of strong rowing. The experience was incredible. I was afraid of the water change because I had been injured (with huge bruises) in the training. Anyway, everything went well, I didn’t get sore. The scenery was beautiful. Crossing the Bay of All Saints, arriving in Morro de São Paulo, leaving early from Morro to Barra Grande, the open sea, the waves, the blue … Beautiful. Sorry, this entry is only available in Portuguese.